As Krishna grew older, his pranks continued to grow with him. Stories about the Little Krishna as a Butter thief had already spread in every household in Gokulam. Everytime the milkmaids crossed, Krishna and his friends shot pebbles at them to break the pots to eat the butter in them. Knowing about Krishna's love for butter, Yasodha kept the butter jars tied together and hung them from high ceiling where the little Krishna's hands could not reach. One day, Yosodha went to river to fetch some water. 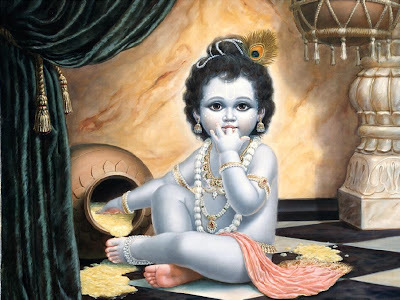 Little Krishna was alone playing in the home then. When Krishna realized that he was alone at home, he jumped with joy and whistled to call his friends. The friends soon huddled together, so that Krishna could climb on their shoulders and reach the butter jars. Soon Krishna climbed on their shoulders and brought down the butter jars. They all sat down to eat the butter, just when Yosodha entered into the house. All the friends ran away and Krishna was caught stealing the butter.